To help reduce disease pressure from bacterial and fungal diseases, rotate with non-related crops for at least 2 years. Space successive plantings in the same year as far apart as possible. Heavy winds and rain may damage leaves and predispose leaves to bacterial infections. 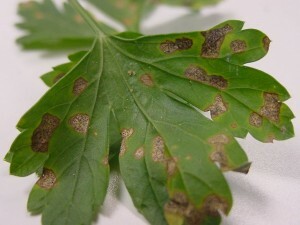 Bacterial leaf blight: Prevention is key. Avoid working in the fields while the foliage is wet to help reduce spread. Scout fields on a regular basis for early symptoms, apply fixed copper at labeled rates with regular maintenance applications for leaf spot diseases and repeat every 7 days. Some copper-based products are OMRI-approved and can be used in organic production systems for the suppression of bacterial and some fungal diseases. Septoria leaf spot: Early detection and prevention are key. Scout daily, and apply fungicides preventatively before first leaf spots appear. Early season infections (i.e., prior to first cutting) will severely reduce subsequent harvests. (*) See labels for specific crop use. 1 Tank-mixing the above with a fixed copper may also help suppress bacterial infections. Organic farmers should use an OMRI-approved copper fungicide on a weekly basis to help suppress septoria leaf spot.